From random security checks at airports to the use of risk assessment in sentencing, actuarial methods are being used more than ever to determine whom law enforcement officials target and punish. And with the exception of racial profiling on our highways and streets, most people favor these methods because they believe they’re a more cost-effective way to fight crime. "Bernard Harcourt has never had an uninteresting thought, or made an argument that does not provoke or engage or delight or enlighten--or do all of those things simultaneously." "This is a creative, provocative, well-researched argument against current practice in sentencing, parole discrimination, and investigative profiling. Harcourt makes the case that a century of social science-inspired thinking about punishment and profiling should be cast out in favor of randomness. It is a position that will be dismissed by many as politically impractical, if not absurd. But that is often the immediate fate of revolutionary ideas." "In Against Prediction, Bernard Harcourt stresses that while the benefits of actuarial predictions have been widely touted, certain costs have been largely overlooked. Indeed, actuarial prediction can under some circumstances actually increase crime, and generate morally problematic social wounds on the profiled classes that might outweigh the benefits even if crime is reduced. Once again, Harcourt has challenged the conventional wisdom in criminal justice policy, and offered an indictment to the practice of actuarial prediction that policymakers, scholars and concerned citizens will have to fully consider." "As debate on profiling and terrorism grows sharper. . . . Harcourt’s book will remain essential reading for those who wish to look past the chestnuts of stale debate on crime and policing, and to see with fresh eyes the problems of the criminal law." "Harcourt welds normative and analytic arguments about risks and actuarial approaches to policing and criminal justice in a novel and readable fashion. This deserves a wide hearing among scholars and students interested in risk, actuaruarial logic and new modes of governance through crime control." "Those whose focus is on behavioral and attitudinal studies should read this book. Why? It is counterintuitive. It offers challenging assumptions. It raises questions about social discrimination." "The book is an excellent and convincing treatise against assuming that an individual’s actions are predicted by group behavior. . . . Against Prediction convincingly argues that the use of economic actuarial methods--predicting individual criminal likelihood based on the quantifiable characteristics of groups to which one belongs--is fundamentally flawed. . . . That we fail to see the harms of prediction, and that we proudly aspire to some quixotic goal of corrective ’efficiency’ is to our collective shame as much as Against Prediction is to Harcourt’s credit." "[These] arguments should be studied by anyone who is considering advocating, or utilizing, formal predictive methods in the domain of law enforcement." "Against Prediction is inspiring in its breadth of erudition, from mathematics to philosophy, sociology, and history, and persuasive in its impassioned and provocative argument. . . . If we want to break the hold that racialist thinking has on criminal law, there is no better place to begin than the apparently neutral actuarialism of the new penology." "[Harcourt] has produced a book of such exceptional quality that this reviewer can only describe his offering as not only a welcome breath of fresh air on profiling, but urgent, required reading for all students of criminology, criminal justice, and, of course, profiling in all its forms. . . . . . . . 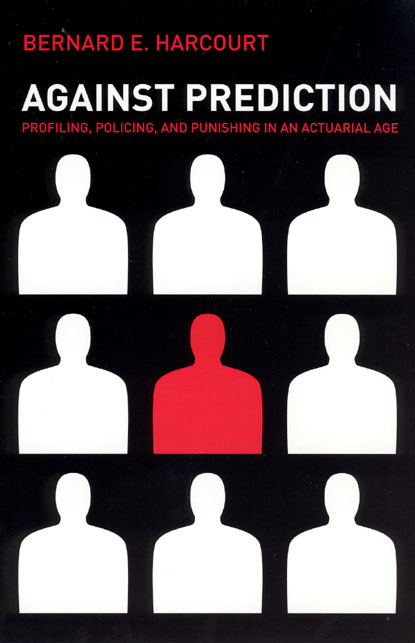 This is scholarly analysis of the bases of actuarial criminal profiling at its very best and is an outstanding book. A new benchmark in the field."